While trade issues have received the bulk of the headlines this year, the upcoming midterm elections present another source of uncertainty for the financial markets. Historically, this has actually turned out well for investors. 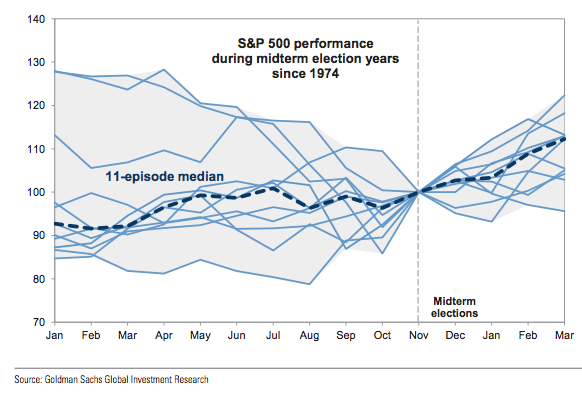 The graph below shows that, in average midterm election years, the market goes up a little during the beginning of the year, stays flat through September, and then rallies by 10% over the months following the election. Positive results appears to be persistent. According to the Capital Group (home of American funds): “Since 1950, the average one-year return following a midterm election is 15%, more than double that of all other years during a similar period.” This appears to hold regardless of whether control of Congress switches from one party to another. So, is the market set to rally following the election? Not necessarily. In most years, an election would substantial lower uncertainties – thereby creating stronger conditions for financial markets. This year, the greatest source of geo-political worries stems from trade issues. Trade policy is predominantly managed by the executive branch of the federal government, not by the Congressmen and Congresswomen that are up for election this November. As a result, even if the Democrats gain control of Congress, the effect on trade policy may be minimal. Additionally, it appears that President Trump is determined to maintain the current course on trade and tariffs irrespective of the outcome of the midterm elections. For these reasons, the election may do little to put the market’s concerns to rest. A more likely upside catalyst would be positive developments in trade talks. The U.S. recently reached a tentative agreement with Mexico, and progress in negotiations with Canada, Europe, or China would likely provide a strong boost to market sentiment. While President Trump’s negotiating posture appears somewhat hardline, he would undoubtedly like to have another agreement along the lines of U.S.-Mexico pact to show voters in November. In this way, the election may play a less direct, but equally valuable role in helping the market rally.